Maureen was such a huge help to me setting up for a party last weekend. She loves to cook and bake and it's a good thing because she has a husband and 3 boys that love to eat. She jokes about the fact that one day she might have to put a lock on the refrigerator so they don't eat her out of house and home. 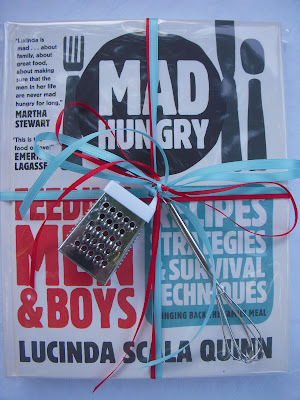 Hopefully this book of recipes and "survival" techniques for cooking for men and boys will help...and the author, Lucinda Scala Quinn works for Martha Stewart! cool cover art! looks like a book i'd enjoy for sure.